In 2012, a group of 50 students at Massabesic Middle School entered the Chewonki Foundation’s Zero Waste Challenge. As part of the challenge, the students sorted and weighed food waste in the cafeteria over the course of one week. Their measurements indicated that 100 pounds of food were being thrown away in the cafeteria every day. The group quickly realized that they could make a positive impact on the environment by composting food waste instead of throwing it in the trash. Placing third in the Chewonki Zero Waste Challenge not only provided Massabesic Middle School with a cash prize; it also connected the school to a local partner. 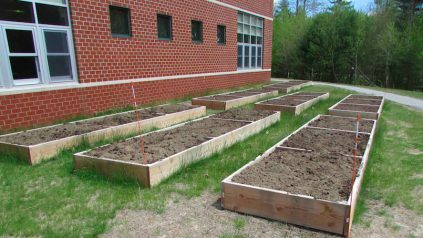 A farmer, reading about the school’s achievement in the newspaper, reached out to Massabesic Middle School to establish a composting partnership. Over the next two years, the farmer collected the school’s separated food scraps and composted them for a fee. With this relationship in place, the school could focus on teaching students, faculty, and staff how to properly sort food scraps. After one week of practicing, the students had perfected their sorting technique. Since 2013, Massabesic Middle School has diverted close to 80,000 pounds of food from the waste stream. With prize money from the Chewonki Zero Waste Challenge, as well as technical support from the Maine Department of Environmental Protection, the school eventually decided to compost its food scraps on-site. The 88-acre campus provides ample space to situate a composting operation, and the school uses the cured compost in its garden, and has recently begun to sell bags of compost to raise funds. The school’s custodian manages the compost pile, turning it with a tractor that the school already owned, while students monitor the activity of the compost pile by maintaining a daily temperature log. Massabesic Middle School hopes to achieve cost savings from composting by renegotiating waste hauling fees to reflect lower waste generation tonnages. Many expected challenges didn’t surface in this program. 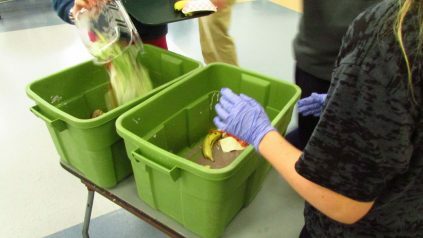 The school was initially concerned that students wouldn’t be willing to sort their food scraps, but they found the opposite. Students have been heavily involved in the planning and implementation of the composting program, from kicking off the initial waste audit to setting up the cafeteria sorting stations. 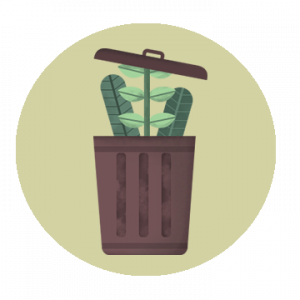 Pests and odors have so far not been a problem for the on-site composting system, but getting a steady supply of horse manure in the quantity has been a challenge. The custodial staff, by picking up and transporting the manure to the school, has been an essential component of the program’s success. 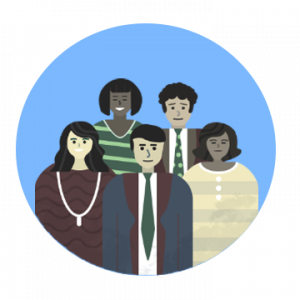 Start at the beginning: Starting in the middle of the school year can present challenges for students to learn sorting behaviors. When food scrap sorting is established at the beginning of the year, it’s less likely to be chaotic. Connect to the curriculum: The composting program is a great way to link food waste to the school’s garden program. Finding ways to connect composting to science and other curricula might help get the program established and provides excellent service learning opportunities. 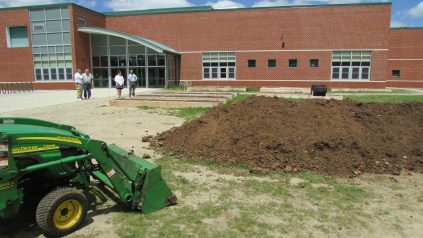 Collaborate throughout the school: Students, faculty, and staff were all on board to compost at Massabesic Middle School, and this was an important element in the program’s success. Taking the time to explain the program and get buy-in from stakeholders was well worth the effort.